Canon fit ultra-wide-angle lens from the Sigma Art series. F1.4 maximum aperture. The first F1.4 ultra-wide-angle lens for full frame DSLRs. Enjoy incredible image quality with enhanced control of light and composition. This bright, fast lens delivers outstanding performance and beautiful bokeh for creative shots. SIGMA has created an ultra-wide-angle lens with F1.4 brightness. To offer an ultra-wide-angle 20mm focal length and F1.4 brightness at wide-open aperture, this lens incorporates a large double aspherical lens 59mm in diameter. With a focal length of 20mm and F1.4 aperture, this lens delivers outstanding large-aperture brightness and bokeh, delivering unprecedented visual experiences. Allowing the photographer to leverage the perspective provided by the wide -angle and the shallow depth of field provided by the large aperture, this lens is ideal not only for such ultra-wide-angle subjects as landscapes and starry skies, but also for snapshots in low light, indoor photography, portraits with a natural bokeh effect, and much more. • Incredible rendering performance delivers unprecedented visual experiences. Enjoy enhanced control of light and composition. • Advanced technologies make a 20mm F1.4 aperture lens a possibility. SIGMA's advanced optical design minimizes distortion, transverse chromatic aberration, sagittal coma flare, and the reduction of brightness toward the edges of the image. Delivering top performance even at wide-open aperture, this lens can be considered the culmination of SIGMA’s Art line. 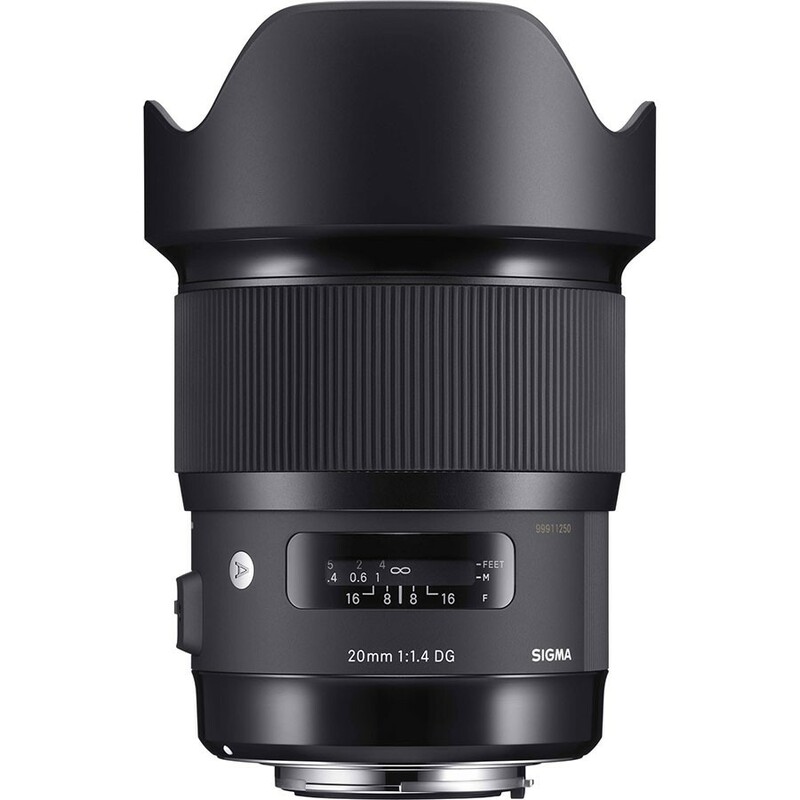 The SIGMA 20mm F1.4 DG HSM | Art incorporates FLD (“F” Low Dispersion)* glass and SLD (Special Low Dispersion) glass elements to minimize chromatic aberration of magnification which is mainly visible around the edge of the image. Moreover the power layout ensures the correction of axial chromatic aberration. Without any color blur, it achieves high image quality throughout the entire focusing range, thus achieving sharp and high contrast image rendering. By improving the efficiency at large apertures and minimizing vignetting, it secures very good brightness. Without considering the lack of light even at the open aperture, it ensures high contrast images for indoor photography, astronomical photography and when photographing blue sky. The HSM (Hyper Sonic Motor) ensures a silent, high-speed AF function. By optimizing the AF algorithm, smoother AF is achieved. It incorporates a new full-time manual focusing mechanism that switches to manual focusing, simply by rotating the focus ring, even when AF is being used. This allows the photographer to make focus adjustments quickly and easily. All SIGMA's manufacturing – right down to the molds and parts – is carried out under an integrated production system, entirely in Japan.